The NFL Draft is quickly approaching. Fans, analysts, players, and coaches are all eagerly looking forward to the 2019 NFL Draft. On April 25, the NFL Draft begins. The New York Giants are heading into a crucial draft for the franchise’s future. After passing on a quarterback in 2018 for the generational running back, Saquon Barkley, there is a lot of speculation as to whether or not the Giants will take on this year. This year’s quarterback class is much weaker than last years. However, this year’s defensive class is one of the best in recent memory. This will put the Giants at a crossroads as they hold 12 picks in the 2019 NFL Draft. Will they address positions of need or simply take the best player available with every pick? In Empire Sports Media’s first mock draft of 2019, I will attempt to predict who the Giants will draft in all 7 rounds of the 2019 NFL Draft. I will provide detailed explanations for the first three picks. 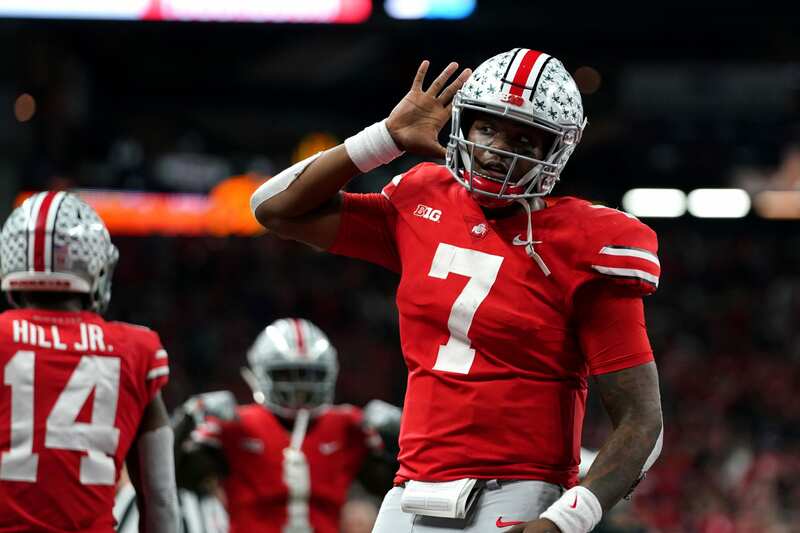 Recent rumors came out recently stating that the Giants were not interested in Dwayne Haskins. Those rumors all went to rest on Wednesday at Dwayne Haskins’s Pro Day. The Giants did not hide their interest one bit, sending Head Coach Pat Shurmur, Assistant GM Kevin Abrams, VP of Player Evaluation Chris Mara, and other scouts and coaches to Ohio State. Dwayne Haskins even said during an interview that the Giants were interested in him. The Giants also had dinner with Haskins the night prior to his Pro Day. It is easy to see why the Giants are interested in Dwayne Haskins. The Ohio State quarterback was incredible during his junior year. He threw a Big Ten record 50 touchdown passes to only 8 interceptions. He also had a Big Ten record 4,831 passing yards. Haskins is a pro-style, pocket passing quarterback. He has the accuracy and arm strength to make every throw, as well as the high football-IQ to beat opponents with his mind by reading coverages and calling protections. Haskins reads defenses better than any other quarterback in this draft class. Dwayne Haskins is the perfect quarterback for the New York Giants. While Kyler Murray might be the more intriguing prospect, he is not likely to fall past the 1st overall pick and is also not likely to fit Giants General Manager Dave Gettleman’s quarterback mold. Dwayne Haskins has also said he is happy to sit behind and learn from Eli Manning. Manning and Haskins have a similar, pocket-passing playstyle, so Haskins should be able to find comfort and success immediately with the New York Giants. Manning is 38 years old and likely only has one season left, so Haskins will not need to wait long. In all likely-hood, the Giants will probably need to trade up to secure Dwayne Haskins. The Jets are the most likely trade partner at the 3rd overall pick. However, it is difficult to say what the Giants would need to give up in this trade. The Jets gave up 3 second round picks last year to make the same trade, but the Giants only have 2 second round picks. This means the Giants would either need to throw in a 1st, a 3rd and 4th, or a player. Since it is so difficult to predict this trade, I have decided to create this mock draft with no trades. As we get closer to the draft I will consider predicting trades in my mock drafts. The New York Giants’ offensive line rebuild is nearly complete. There are only missing one more position: right tackle. Cody Ford played right tackle at Oklahoma. Some NFL analysts think he will play guard in the NFL, but if he is drafted by the Giants, he will need to play right tackle. With all of the defensive talent in the 2019 NFL Draft class, it will be hard for the Giants to pass on an impact-defender at 17. However, Ford has an extremely high ceiling at a position of dire need for the Giants. Cody Ford is an extremely agile offensive tackle. His quickness allows him to stay in front of speed rushers and protect his quarterback. Ford also has the strength and power to contribute in the run game. Dave Gettleman’s love for “hog mollies” is probably too big to pass up on a versatile lineman like Cody Ford. The Giants might look to trade up with this pick to take an elite defender. Or, if the Giants trade up from 6 to 3, they might try to trade back from 17 to get the assets back that they lost in the trade for the 3rd pick. If the Giants are unable to make any trades, they will be more than happy to draft Cody Ford. As badly as I wanted to pair former Ohio State wide receiver Paris Campbell with Dwayne Haskins here, I could not go 3 picks into this draft without taking a defender. The Giants have so many holes on defense. They need to find defensive starters in the draft. The Giants cannot wait until the 3rd round to take a defender. Thus, the Giants take Jaylon Ferguson in the second round of this mock draft. The Giants traded away their best edge defender, Olivier Vernon, in the 2019 offseason. Vernon simply did not produce enough sacks with the Giants. Not to mention he was being paid a high salary and was consistently injured. Jaylon Ferguson would be a perfect replacement for Olivier Vernon. The Giants would go from getting a player who produces minimal sacks to having the NCAA record-holder for most sacks in a career. Ferguson totaled 45 sacks in 4 seasons at LA Tech. In 2018, as a senior, Jaylon Ferguson totaled 26 tackles for loss and 17.5 sacks. Ferguson was an extremely productive player throughout his collegiate career. Ferguson is solid as a pass-rusher and a run-defender. He has strong hands and a big frame, allowing him to fight through contact and get to the ball-carrier. A tandem of Lorenzo Carter and Jaylon Furgeson could give the Giants one of the best, young defensive cores in the NFL. Both have the potential to be great players in the NFL.